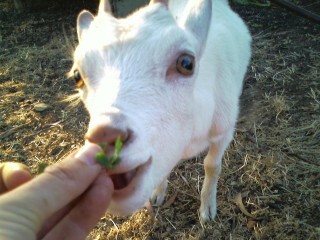 On the weekend, sometime overnight on Saturday, little Tansy, our hoofed funny friend – died. (At least we think it was Tansy, it’s still quite hard to tell them apart). For a few days, Tara has been pining for her playmate. We’re not sure why Tansy died, the theories are everything from an existing condition to a snake or spider bite. She just died in her sleep. Needless to say, it was damn sad and I couldn’t bring myself to actually look at her. By being in total denial, I managed to keep it completely together over this most significant death on the farm. No burnt falafels this time. Losing ducks and chickens is bad enough, losing something as large and with such prescence and personality, aches badly in the heart region. I took a modern approach, to grief – supress that emotion and get on with the week. 😉 The more animals that you let into your life, the more that depart it. Anyway, it presents us with a problem that needs solving. 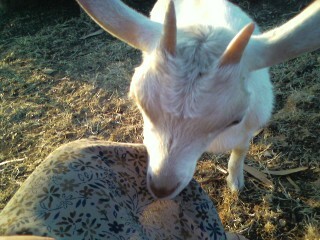 Goats need company so we’ll need to get another, preferably around the same age. I wonder if anyone sells goats at Christmas? I realised I haven’t posted any recent photographs of them, so here’s some of Tara taken tonight.